Very quick delivery! Great price! Goji Juice Blend by NOW has kept me healthy thru the winter months. Loaded with antioxidants!! The flavor of Goji Juice Blend by NOW is really good, has a tangy bite to it. I think it is a great blend just wish it was preservative free and in a glass bottle. Goji Juice Blend by NOW is a great blend of Goji and other juices. Good source for phytonutrients and I really like the tangy flavor! And, the price is great, too! Grown in the nutrient and phosphorous-dense soils of valleys bordered by the towering Himalayan Mountains‚ natives have considered the Goji plant (Lycium barbarum) an important and nutritious food for centuries. The plant's tender‚ fragile berries are teeming with a wide array of nutrients‚ including free radical scavengers‚ polysaccharides‚ and other phytonutrients. Goji's versatile and unique nutritional profile may help protect healthy cells‚ support immune and nerve function‚ and may help to support normal glucose utilizatioin by the body. 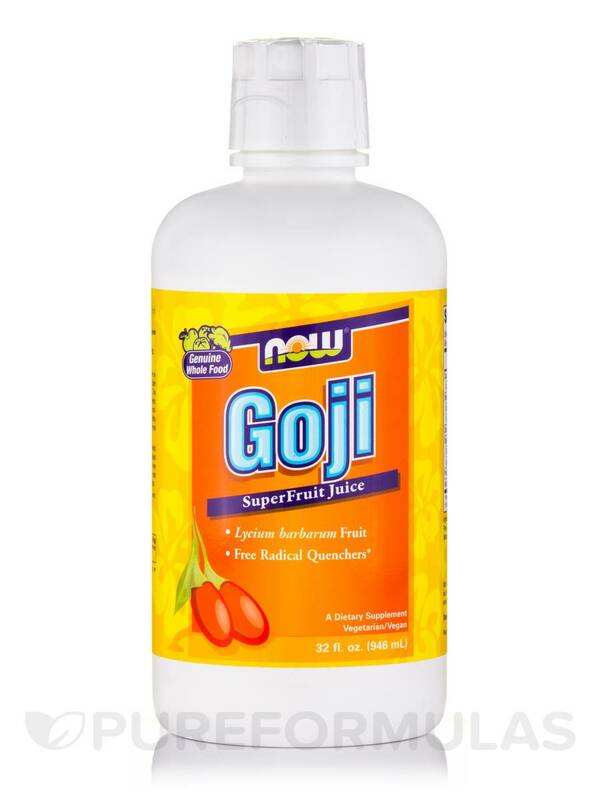 NOW® Goji Juice Concentrate tastes so good that you may have to remind yourself that you're drinking something healthy. Each 1 oz. serving is loaded with the nutrients you need to thrive. Since its earliest applications‚ all the way to modern day use‚ the sweet juice from ripe Goji berries has stood the test of time‚ and remains one of our planet's most perfect and nourishing foods. - Potent Source Of Antioxidants and Carotenoids. 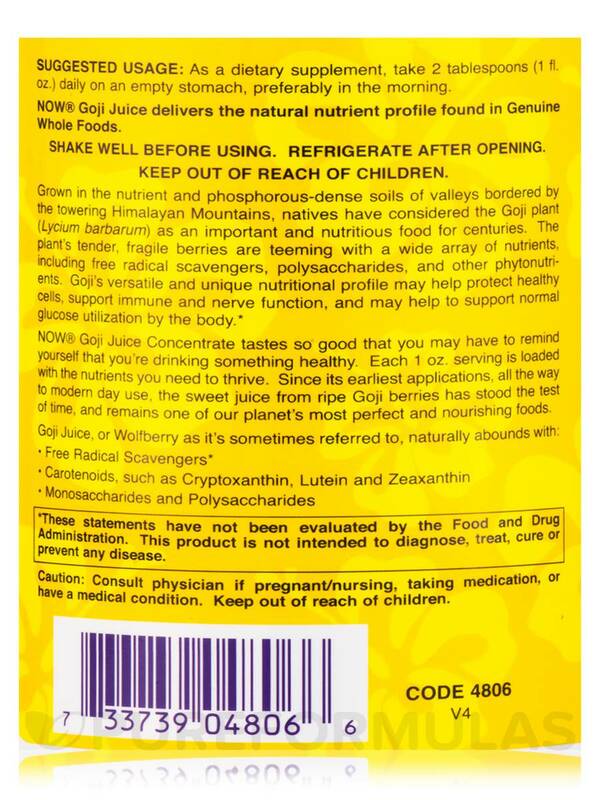 NOW® Goji Juice delivers the natural nutrient profile found in Genuine Whole Foods. Ingredients: Goji Juice‚ Triple Filtered Water‚ Black Cherry Juice Concentrate‚ Pear Juice Concentrate‚ Apple Juice Concentrate‚ Natural Flavors‚ Citric Acid and Potassium Sorbate (as a preservative). 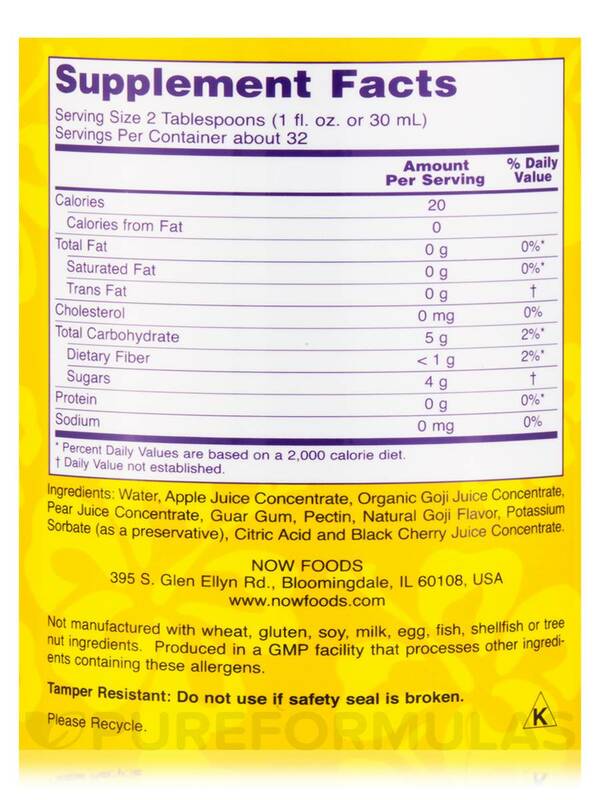 Contains no added sugar‚ salt‚ starch‚ yeast‚ wheat‚ gluten‚ corn‚ soy‚ milk‚ egg‚ shellfish or artificial color/flavor. Vegetarian / Vegan / Kosher / Made in the USA. 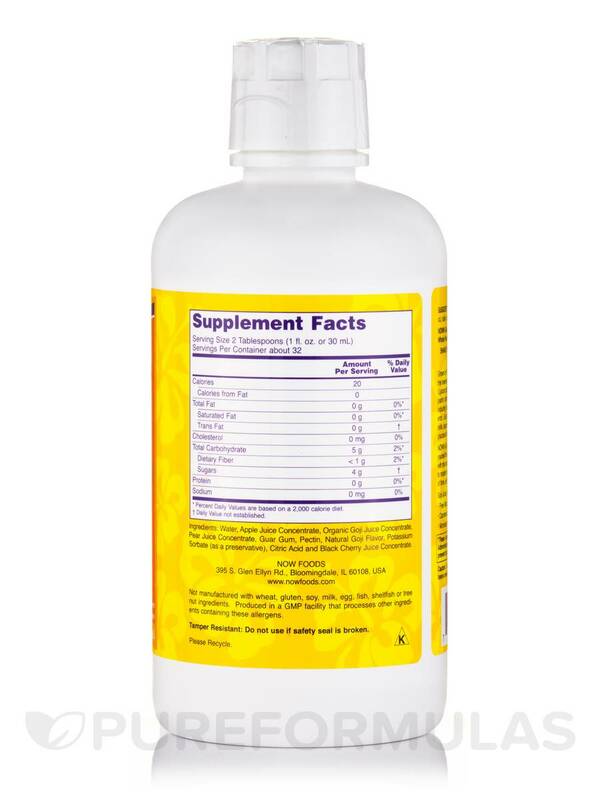 As a dietary supplement‚ take 2 tablespoons (1 fl. oz.) daily on an empty stomach‚ preferably in the morning. Consult physician if pregnant/nursing‚ taking medication‚ or have medical condition. Goji Juice Blend by NOW taste good. Have not seen what it is suppose to do yet. 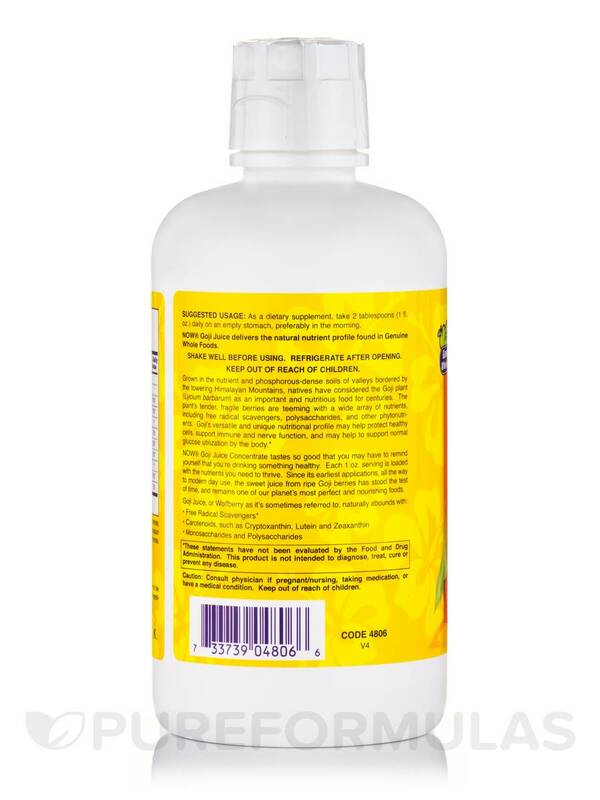 The tangy flavor, the health benefits and the price at PureFormulas! I like the tangy flavor! The design of the bottle, you have to be careful when you pour it because it tends to overpour and leak down and waste more product that way. Also, wish it was preservative free and that it came in glass instead of plastic. But, overall, still like the product.